Publisher of Who’s Who in America and many other Who’s Who titles since 1899, Marquis immediately recognized that the growth of the Internet would be an asset to their business model, not a threat. 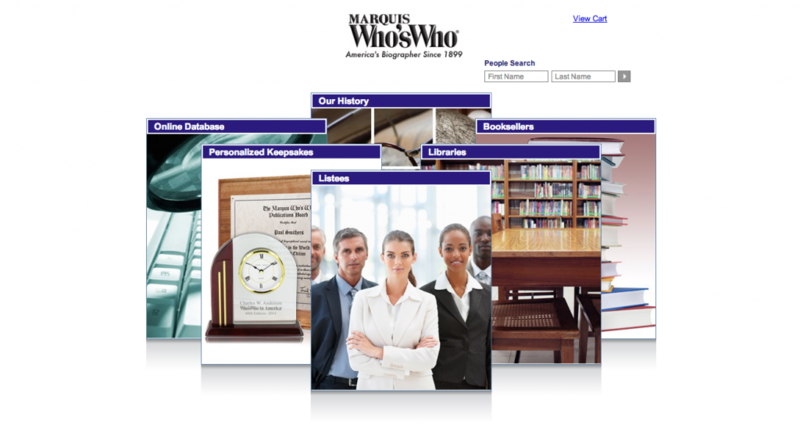 Marquis relies on the public to nominate who is eligible for inclusion into Who’s Who; Zelacom helped them develop a strategy to use the web to find qualified candidates for inclusion in their flagship book or one of the many niche versions they updated annually. Zelacom was brought in on this project by our design associate, Webb Communications. As the primary design consultancy for Marquis, they recognized the scope of work was extremely technical, and was familiar with Zelacom’s track record on similarly high-functionality projects. While managing the project and working on the design aspects, Webb knew they could trust Zelacom’s high standards to strengthen their relationship with this important, high profile client. With a century of experience, Marquis had a clear process for vetting applicants, and didn’t wish to remove the human factor from making the judgments. Zelacom designed a system which allowed users to nominate themselves or other individuals, and which could flag those who were unambiguously inappropriate for inclusion. The application process also drilled down and identified which of the company’s eleven Who’s Who volumes would be the best match, and automatically forwarded the information to experts in that subject area for final review. The approved biographies were published in print and in an online database, which was available by subscription. The books and database subscriptions are largely purchased by libraries, universities, and the individuals who are listed. In addition, Zelacom built the company’s first eCommerce site associated with the Who’s Who brand. Beyond the books themselves, Marquis generates significant revenue by selling personalized keepsakes such as plaques, trophies, and clocks, and was now able to sell the merchandise online, in addition to their traditional methods. This was a typical example of how large, somewhat lumbering corporations manage new technology ventures: outside experts such as Zelacom are hired to innovate a solution, and the resulting software is then maintained in-house by existing staff. A version of the original solution is still used on the company’s site today, a decade after the initial development.